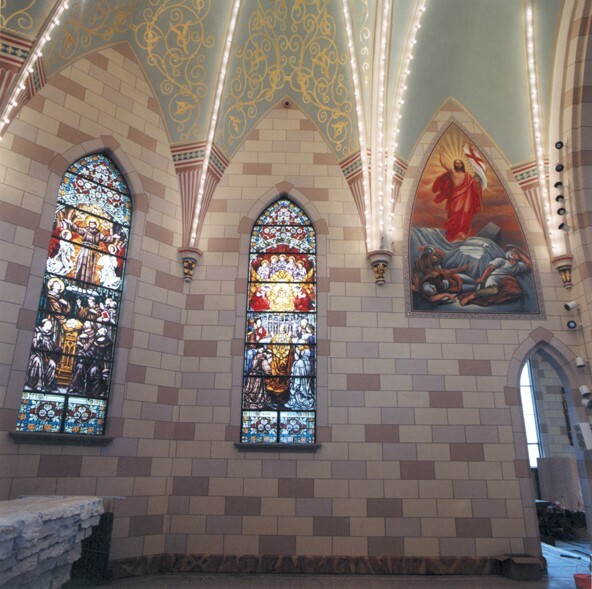 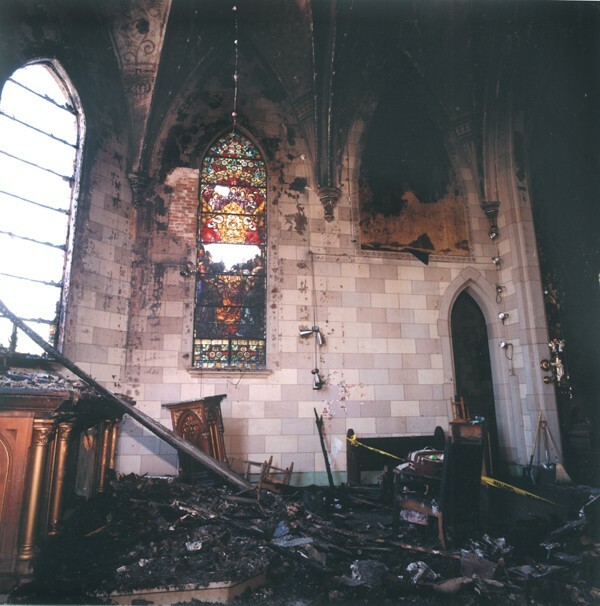 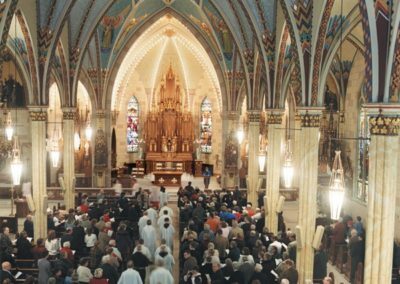 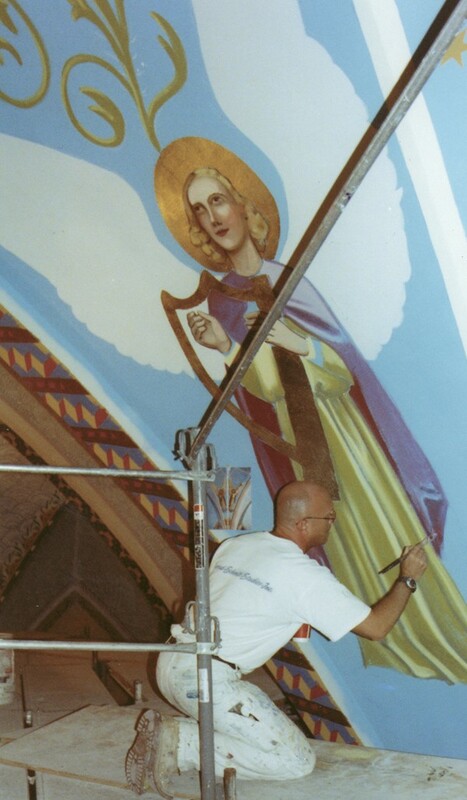 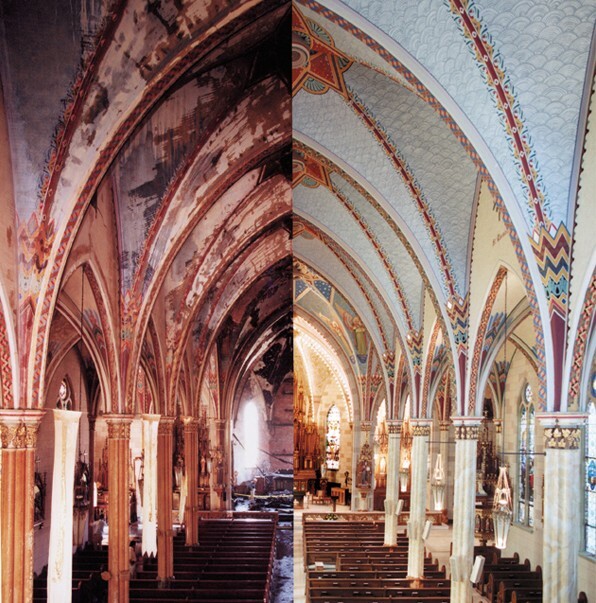 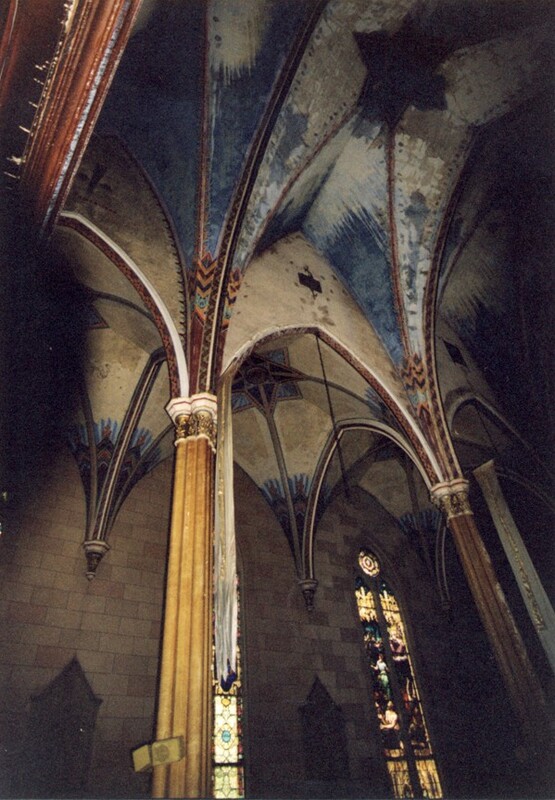 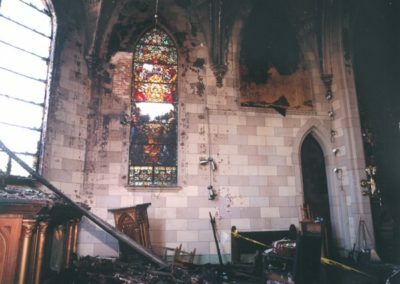 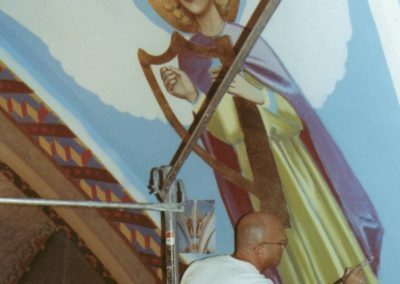 Following a devastating fire in April, 2001, the goal of the restoration of the historic Sacred Heart Catholic Church in Indianapolis, was to return the interior of the 1891 church to its appearance prior to devastation by fire. 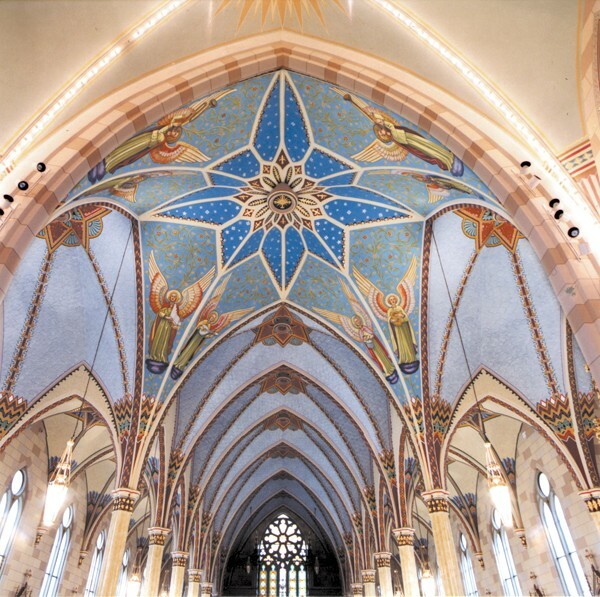 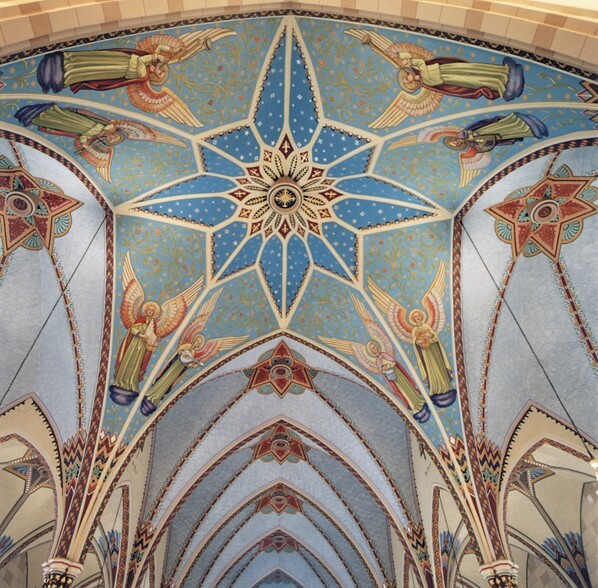 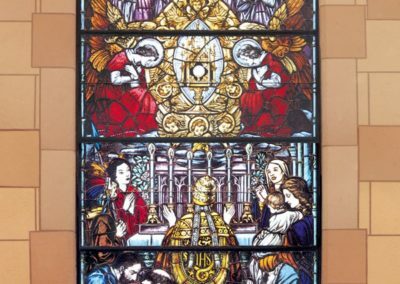 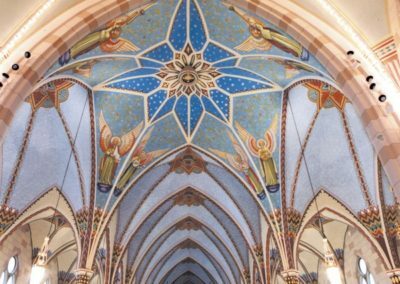 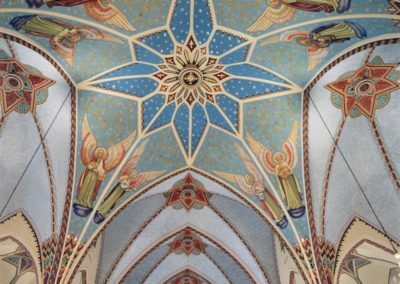 This involved the replication of four, turn-of-the-century sanctuary windows originally created by Mayer of Munich, the conservation of fourteen nave windows, the replication of eleven murals and the decorative historic interior painting throughout the church. 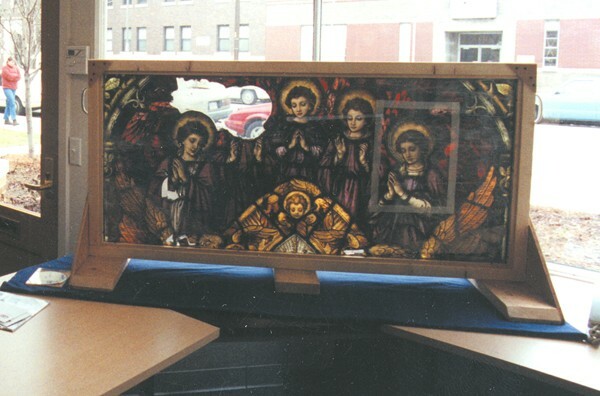 The project began with a competition among four studios to replicate an existing panel as closely as possible. 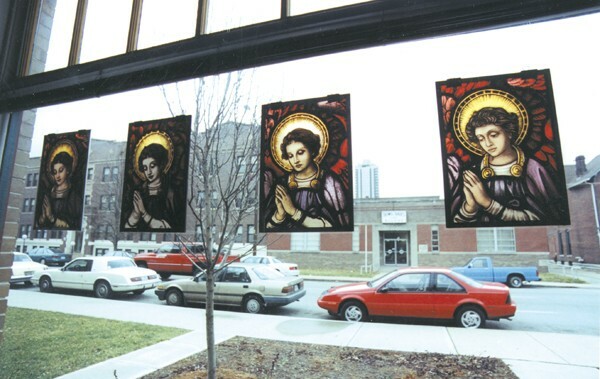 Conrad Schmitt Studios most successfully re-created the original types of glass and paint, as well as the artistic style. 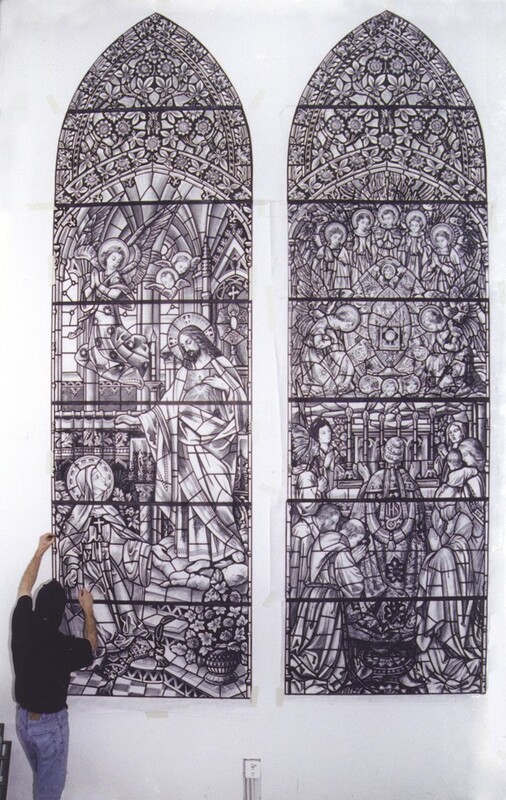 The new, full-size drawings or “cartoons” to guide the replication of the Mayer windows were created from remnants of the original windows as well as from photographs. 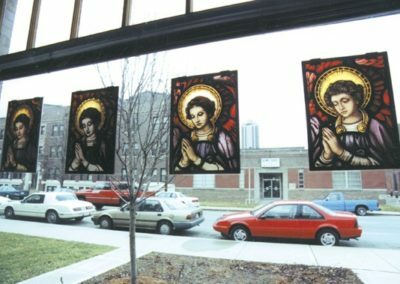 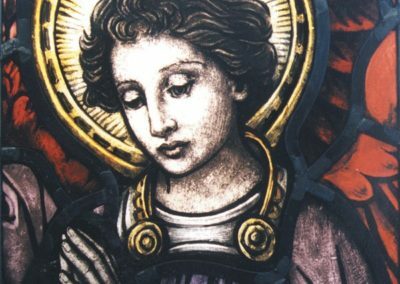 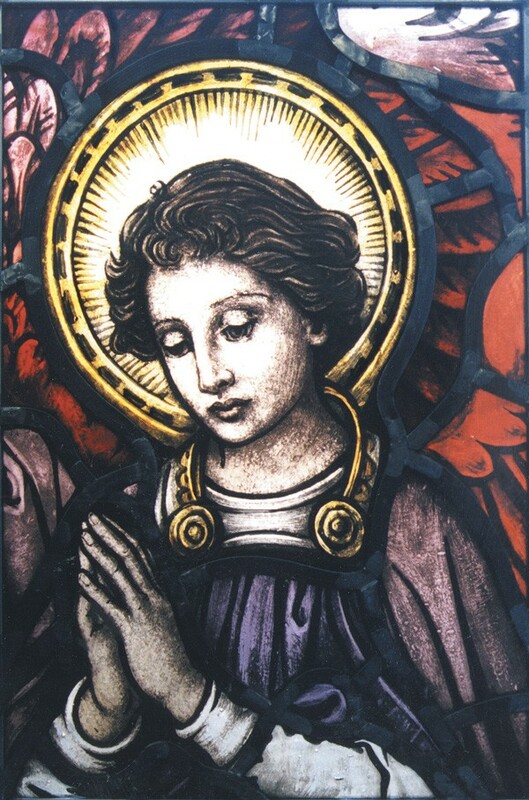 The glass was matched, cut, and meticulously repainted to look exactly like the original. 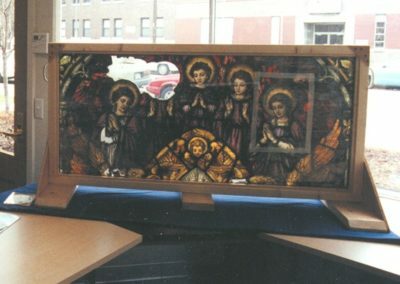 The panels were then kiln-fired to give them permanency, reinforced and installed. 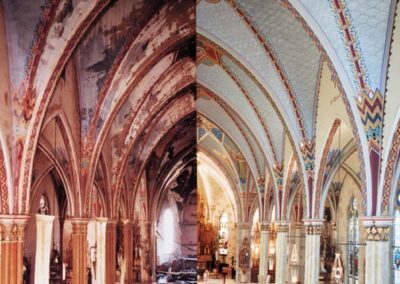 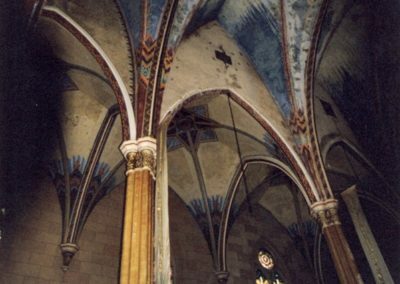 The historic interior painting was restored to its pre-fire scheme. 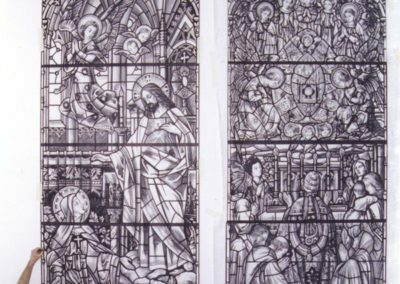 Interestingly, the still extant 1936 scheme had been the work of Alphonse Schmitt, a son of Conrad Schmitt. 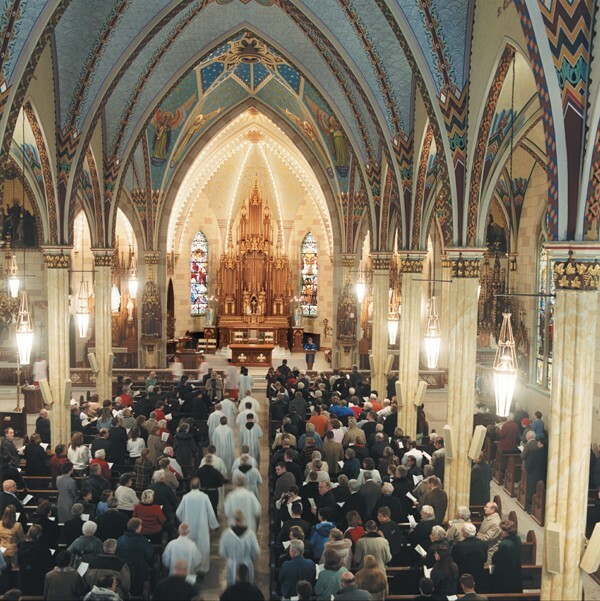 The restored church was rededicated eighteen months after the fire, with Catholic dignitaries in attendance. 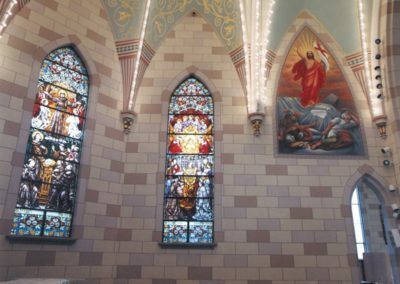 The award-winning restoration has renewed the worship space and the spirits of Sacred Heart parishioners.